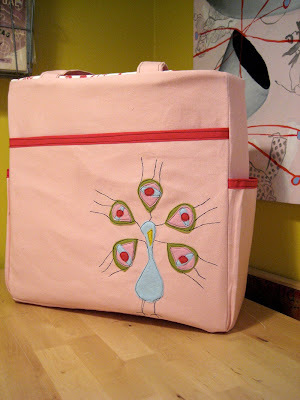 My new large tote design..in pink! Mr. Peacock looks so ready for spring in his glorious pinks, blues, red and olive green. This heavy duty tote is large enough for your papers and light groceries, books, personal items and small lab top. Made of heavy duty cotton duck canvas, lined with stiff interfacing for shape and durabilty, as well as stand up power! Mr. Peacock is made of a wonderful blend of 30% wool and 70% synthetic purchase trade free from an etsy seller living in England! Three exterior packets, one large flap pocket in the front and two side pockets that are perfect for water or baby bottles, or a thermos full of coffee. Interior is lined with Anna Griffin's Darcey set, Silhouette Floral in Red, and Michelle Engel Bensko, Birds in Natural, Dogwood Fabric for the sides and pockets. Check it out here at my shop. This is my favorite one yet!! !